Rectangular handrails shown are manufactured from solid bar stock: bronze, stainless steel, or aluminum filled stainless steel tubing. 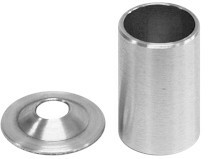 The ends are straight or turned in approximately 3. Included are 5/16 x 3-1/2 studs, and 1-1/2 x 1 round standard or removable spacers (one spacer for every 2 feet of handrail). Advise model spacer required. Custom spacing available. 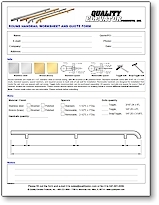 See work sheet for details. 3/8" x 2", 1/4" x 1-1/2"
Stainless steel solid rectangular bar stock. lighter and less expensive than solid bar. 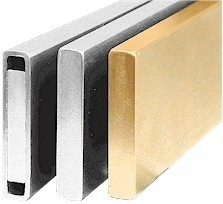 Bronze solid rectangular bar stock. 3/8" x 3", 3/8" x 4", 3/8" x 6"
Models listed are straight, with standard spacers. For removable spacers, add R to model, i.e. - SSHR36R. For bent handrails, add B to model, i.e. - SSHR48B.